By Steven Ocallaghan: This Saturday, the 22nd of September in Glasgow we have a great match-up with World Boxing Organization (WBO) lightweight champion Ricky Burns defending his belt against a very tough Kevin Mitchell. A tough fight for both guys, who out of the ring are good friends. A lot of talk was made of the face off on BoxNation but we don’t need to trash talk every fight, we can leave that to the Broners and Mayweathers of this world. Burns has beaten good fighters along the way , Paulus Moses, Michael Katsidis, both former world title holders. He also has beaten fighters like Michael Gomez and Nicky Cook. All in all, Burns has faced 6 previous fighters who at some stage held world titles losing only once when he was an inexperienced novice against Alex Arthur. The best win for Burns is undeniably against Roman Martinez who at the weekend became WBO super featherweight champ for the second time. 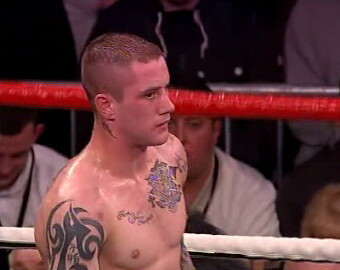 Ricky Burns is still the only fighter to beat the very tough Martinez. Kevin Mitchell himself earned the right to a title shot after a tremendous win against the previously undefeated John Murray in an 8 round war. Mitchell previously defeated Amir Khan victor, the hard hitting Breidis Prescott. After the Prescott fight he challenged Michael Katsidis for the interim title only to suffer heavily from a 3rd round stoppage. Mitchell’s crazy lifestyle had eventually caught up with him. The night before the Katsidis fight he had been out drinking heavily and didn’t get home till well after 2am. Not the ideal preparation for a title fight. Mitchell has turned his life around now, he trains hard, is off the alcohol and has sorted out domestic problems and can now focus on the job. He easily out pointed Felix Lora in a stay busy fight and now is ready for his title shot. I see Burns winning by about 2 rounds in a very exciting battle, I think the bigger Burns will be just a little to strong. It’s a great match-up for British boxing and a fight that won’t let anybody down. « Chavez Jr. beaten by Martinez: Where do they go from here?